On October 28, 2016, 330 master’s and 15 doctoral students from programs at the Waterloo campus will be graduating from the Faculty of Graduate and Postdoctoral Studies (FGPS) at the fall convocation ceremony. The ceremony begins at 9 am and is held in the Waterloo Memorial Recreation Complex. 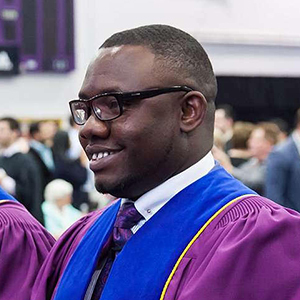 The convocation ceremony is followed by a reception in the Paul Martin Centre for friends, family, and faculty to celebrate the success of the graduating students. The convocation ceremony for Brantford is Nov. 1, and will include the 18 master’s students graduating from programs on the Brantford campus. The ceremony begins at 2:30pm at the Sanderson Centre for the Performing Arts, and is followed by a reception in the lobby of the Research and Academic Centre. The FGPS is pleased to announce the winners of the Governor General’s Medal, and Medal for Academic Excellence at the graduate level. The Governor General’s Medal is awarded at the fall convocation to the graduate student who achieves the highest academic standing in a master's or doctoral degree program at either the spring or fall convocation. This year’s winner is Nicole Scheerer, PhD in Psychology. At the doctoral level, the winner is Alex Benson (PhD in Psychology). Congratulations to all our graduands and to the winners of Laurier’s academic medals.